Batman Eternal #1 Review- Is Amazing! Overall this is another fine installment in the Batman Eternal Series. It may actually be my favorite next to #1 so far. A lot of things are happening but it reads smoothly and understandably. The cover which features Batman squaring off against Batgirl is rad. Once again they add the rain into the cover and Gotham always looks best in the rain. Art wise there is a subtle shift in style. It gets a little more slick and a little less gritty however I did not find the change at all distracting. The art is still top notch. We also get a brief, very brief hero on hero battle. Which I always enjoy even if every other geek screams it is out of character. Who will win in a fight between Batgirl and Batman? Eternal #4 says Batman. The gang war is fully on and Falcone's forces are striking at numerous weapon of the Penguin's weapon caches. Penguin is pulling together his forces but is surprised at how fast Falcone is striking. Commissioner Gordon is brought into court and things do not go well. He is denied bail as he is deemed a flight risk for his association with the masked vigilante elements of Gotham. He is then seen brought into Blackgate prison where the Warden a character he dismissed is out to get revenge. Gordon will not likely last long in the Blackgate, his time there is basically a death sentence. Batgirl makes her first sizable appearance here. First she gets highly emotional in the court room and has an outburst as her father is denied bail. She also gets emotional, and starts beating up thugs. She ends up having to restrained by Batman and then she lashes out at him. This is where the brief battle that the cover show cases comes into play. It is not a long fight. She gets in a few swings and Batman flat out grabs one of her punches. Batgirl cools down and begins to think like the expert detective she is. She finds a lead that Batman seems to have overlooked and leaves to pursue it. The other major thread is following up on Stephanie and her running from her father, the evil Clue Master. She apparently heard the plans being discussed by the group of villains and their plan is to "Burn down all of Gotham." Which is never good. I am wondering if the shadowy figure that was presiding over the meeting ends up being the ultimate big bad at the end of series. 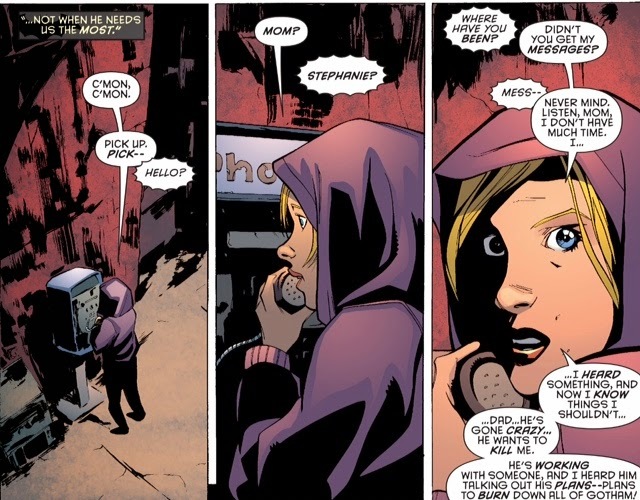 Stephanie does what any teenager running from her homicidal father is likely to do - she calls mom. Unfortunately, it seems her mother is in cahoots with her father and immediately tips him off. This girl can not catch a break.